In our Gospel reading (Luke 1:39-45), we hear of Mary's visit to her cousin Elizabeth, who was pregnant with John the Baptist. 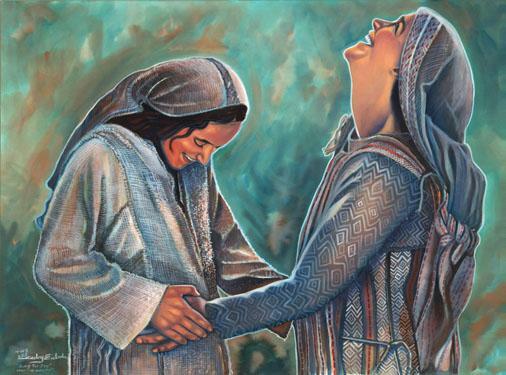 Elizabeth was the first to proclaim the child in Mary's womb as "my Lord" as Elizabeth's own child in her womb "leaped for joy" at the sound of Mary's voice. In our Epistle reading (Hebrews 10:5-10), we hear of Jesus's offering his own body in suffering for the sins of the world once, for all, in contrast to the repeated and imperfect sacrifices of the priests under the old law. "Behold, I come to do your will, O God." Brothers and sisters: When Christ came into the world, he said: "Sacrifice and offering you did not desire, but a body you prepared for me; in holocausts and sin offerings you took no delight. Then I said, 'As is written of me in the scroll, behold, I come to do your will, O God.'" First he says, "Sacrifices and offerings, holocausts and sin offerings, you neither desired nor delighted in." These are offered according to the law. Then he says, :Behold, I come to do your will." He takes away the first to establish the second. By this "will," we have been consecrated through the offering of the body of Jesus Christ once for all.